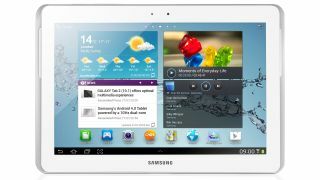 The long wait for the Samsung Galaxy Tab 2 10.1 looks like it'll finally come to an end next week. The next-gen tablet, which was announced back in February at MWC and has been on sale in the US since May is now listed on the Carphone Warehouse website. The retailer says it is expecting stock of the Ice Cream Sandwich tablet on August 22, which means eager UK tablet fans should be able to pick one up next Wednesday. The 16GB Wi-Fi-only device costs £299 while the 32GB Wi-Fi + 3G version will set you back an extra c-note. Both versions are available in black and white. The Galaxy Tab 2 10.1 features a bright 1280 x 800 LCD display and a slightly-redesigned chassis, with the intention of keeping Apple's eagle-eyed lawyers at bay. In a recent TechRadar review, it scored a rather modest 3.5 stars out of 5, with our reviewer describing it as a "middle of the road tablet," which lacked the design identity of the initial device. With more Android tablets than ever available at a more reasonable price, perhaps the delay will prove costly for Samsung.